The text of Bethesda Friends Meeting reports in the Interchange are below, with the most recently received at the top and older reports below. To jump to a particular report, simply click the year listed below. On March 9, 2019, Bethesda and Annapolis Friends gathered at Collingwood retirement community for the memorial service of Ted Hawkins, beloved member of Bethesda and later, Annapolis. Moving messages testified to Ted’s warm and loving spirit, his many talents, the high regard in which his colleagues held him, and the deep love and appreciation of his family, his friends and his community at Collingwood. He will be deeply missed. Bethesda Friends will soon be holding a celebration to mark the first year of our connection with the Zazai family. They immigrated to this country from Afghanistan in late March of 2018, and the Meeting has taken them under our wing, helping them with furnishings and clothing, transportation, finding employment, understanding and accessing medical help, and more. They are a real success story; the husband has a job he loves and at which he excels; the children are healthy and enrolled in school; the wife (who had been illiterate in her own language) is learning to read, write and speak English. Moreover, they give back to us in warmth, enthusiasm, and courage as much as they receive from us in care and help. On April 28, Bethesda Friends will gather for our annual Spring Fling, which raises money for 3-5 scholarships to Ramallah Friends School. We get together to enjoy Middle Eastern Food, listen to music, browse the “white camel” sale, and participate in our silent auction. This is a great community building event and it gives us great joy to support Ramallah Friends School. Bethesda Friends are thrilled to report that the refugee family we are helping arrived here on March 27. Some of us greeted them at the airport and drove them to the apartment which others had furnished and supplied for them; others brought over a welcome dinner. One member took them to the kite-flying event on the mall the Saturday after they arrived, and another member took them to see the cherry blossoms. Interspersed with these fun activities there has been a great deal of work – though very pleasurable work – to orient them to their neighborhood and the transportation system, help them shop for food and clothing, get their young children registered for pre-K and Head Start, get them signed up for medical assistance, get them social security numbers and identification, work on getting a driver’s license for the husband, and work on getting a job for the husband. The family is delightful – friendly, hard-working, and eager to start life anew here. We on this team are so heartened by the level of energy, cooperation and positive spirits with which we have all worked together, and with the deep pleasure of getting to know this family and help them get settled. On a different note, on Sunday April 22, we will be holding our annual Spring Fling at Bethesda Friends Meeting to raise scholarship money for Ramallah Friends School, and many people are also working very hard to make this year’s event a great success. It is a deep pleasure to know that we can help send several young children to Ramallah Friends School who otherwise could not have attended. This past October, Bethesda engaged in a spirit-led process to decide what we would do in response to the news that Sidwell Friends Lower School (whose campus our Meeting House is on), was going to move from Bethesda to Northwest DC. Sidwell Friends School generously offered to bring us with them in this move, since they were going to build a Meeting House for the lower school that would be appropriate to our needs. The other possibilities available to us were to rent a space or to buy property; both these options might have allowed us to stay in the Bethesda area. Our Meeting embarked upon a year-long discernment process, during which a very hard-working and dedicated ad hoc committee gathered information relevant to our choices, solicited feedback from members and attenders via a sophisticated survey, and held several threshing sessions during which questions, concerns, and hopes could be shared. This process culminated with two Called Meetings. During the first Called Meeting, our clerks, Ralph Steinhardt and Susan Kaul, encouraged us to first share our sense of the principles by which we hoped to make a decision. As people shared ideas, these were written on large pieces of paper and posted on the wall. Among the sixteen principles generated were: “We should proceed in a way that our community is even stronger after the decision than it was before the decision;” “Anyone who speaks in favor of a particular decision should address the concerns of those who resist that option,” and “We should keep our hearts open to the Light and to one another.” Many thoughts, hopes, visions, and concerns were shared. It was clear after three hours that our discernment process was not concluded, and we agreed to meet again the following Saturday. During our second Called Meeting, the messages began to cohere and to lead us to unity. We minuted our unity thus: Bethesda Friends Meeting joyfully and gratefully accepts the invitation of Sidwell Friends School to move to the consolidated Wisconsin Avenue campus. A sense of thankfulness and joy accompanied this decision, and the Meeting expressed enormous gratitude for the work of the ad hoc committee, the guidance of our clerks, and the thoughtful and spirit-led participation of our members and attenders. In the midst of some uncertainty as to where we will be located after Sidwell Friends School sells the campus of the Lower School (where we have been located for over 40 years), our Meeting continues to thrive in many ways. We have welcomed 10 new members since April – four by convincement, one by transfer, and five who transitioned from junior membership to full membership. We are delighted to have these new members! -- the Bethesda Friends Meeting book group continues to meet once a month to discuss books chosen by the group. They are usually of a spiritual nature. Some are by Quaker writers; others by writers of other spiritual traditions. The discussions of the books have provided a wonderful avenue for the participants to know one another more deeply as we share our perspectives on the books, our spiritual questions and concerns. -- Our cherished member, Bill Dietrich, shared his spiritual journey with us on May 22. It was a very moving event, during which we learned more about the many strands of spiritual nurture that have fed Bill over the years and contributed to his depth and wisdom. -- We’ve had a session on Quaker Decision making, during which we explored more deeply the process of Quaker discernment and decision making so that we may be more open to the guidance of Spirit as we move forward with deciding where our Meeting will be located once the Sidwell Friends Lower School property is sold. -- Since April, a number of people from Bethesda Friends Meeting have held a “Black Lives Matter” rally in downtown Bethesda, handing out buttons and pamphlets, and talking to people about the movement. This is a way of reaching out with our testimony of equality. They have found many people curious about and open to the message. -- Our Spring Fling, silent auction, and plant sale raised over $14K for Ramallah Friends School, a beacon of learning and hope in a very troubled land. These funds support scholarships for young students who otherwise would not be able to attend this excellent Quaker school. -- Our Environmental Sustainability Group has had several meetings, and participants are sharing helpful information with one another; the group hopes to address ways that we as individuals and a faith community can address the threat of global climate change, and the pressing issue of sustainability. Finally, we have worked to strengthen our community. We have had two sessions on the theme of “Grow Your Meeting.” The growth referred to is not simply growth in numbers, but a deepening of our knowing and caring about one another. Lauren Brownlee, Jane Coe, and Peirce Hammond all attended the BYM session last fall entitled “Grow Your Meeting,” and returned inspired with many ideas for building vitality and health, and helping us become a more genuinely welcoming Meeting. They have shared these with us during two very enjoyable sessions. And – we like to have fun with one another! Our Spring Fling brought in more people, and more children than ever, and was a lively affair with great food and music, and many toys for the children. And our family camping weekend at Catoctin provided another opportunity for enjoying one another and the gifts of nature. Bethesda Friends Meeting has reached unity in support of the Shared Quaker Statement on Climate Change. Our Environmental Sustainability Group, in conjunction with our Adult Religious Education Committee recently offered two workshops to help us consider our part in this. On February 14, Phil Favero, a natural resources economist from Annapolis Friends Meeting, led us in an exploration that joined science and spirituality, to help guide us as we try to respond to the threat of global climate change. On February 28, Deborah Haines offered a forum on “Friends and Nature,” in which she talked about the significant influence of nature and images from nature on the spirituality of early Friends. On April 3, we will be gathering to discern how we might best respond as a faith community to the threat of global climate change. In our continuing series called “Spiritual Journeys,” our Friend Bernie Benson recently described how he came to be a Friend, and talked about his many sources of spiritual inspiration and nurture. Accompanying himself on the guitar, he also sang three songs he was inspired to write as expressions of his spiritual life. It was a deeply meaningful gathering for all there. We are so grateful for the kinds of sharing and dialog that the Spiritual Journeys series engenders. The thoughtful and caring outreach of our Pastoral Care Committee to many young adult associate members has resulted in six young adults in our Meeting choosing to become full members. In addition, over the past three months, we have welcomed five other new members to our Meeting. Our new website seems to be a helpful source of information and a welcoming resource, as we have noticed more new attenders in our Meeting recently. At the same time, we very much miss our members who have chosen to move away to be closer to their adult children. Somehow, with all these comings and goings, we still feel ourselves to be the same Meeting; the center holds, and we are grateful for our nurturing community. Bethesda Friends Meeting is facing a major decision and at the same time a real opportunity for clarifying who we are as a Meeting, and what we envision for ourselves in the future. Since 1964, we have shared the grounds on which our Meeting House stands with Sidwell Friends Lower School; over the years, we have had a collaborative and fruitful relationship with the school. Sidwell Friends School now plans to sell the property, and move the lower school to a piece of property they have purchased in Washington DC adjacent to the upper school. They have welcomed us to join the lower school in this move. The clerks of the Meeting have appointed an ad hoc committee to consider our options, as we will clearly be moving from our current location by 2019, and will need to clarify what we’ll be doing long before that. The ad hoc committee has been tasked with gathering information about a variety of issues related to our options, and sharing these findings with the Meeting as a whole, so that we can discern what arrangements will best serve us and our vision of ourselves as a Quaker community as we move forward into this next part of our journey. Other notable events and activities this past fall have included the launch of our new website, much improved from our old one, for which we heartily thank the ad hoc website committee (composed of many members of our Advancement and Outreach Committee, joined by some others in our Meeting). We sent several representatives to the FGC workshop called “Grow Your Meeting,” at Valley Friends Meeting in Dayton, VA, and they came back with much enthusiasm and many ideas for how we might grow both internally, amongst ourselves, and externally, as we reach out to others. The children, along with some of their family members and other members of the Meeting, participated in our yearly fall walkathon for the homeless, the proceeds of which go to the Interfaith Housing Coalition. The children also participated in a coat drive for Syrian refugees and gathered many coats. In December, we had our annual Christmas celebration, during which the children presented a play, and the orchestra (comprised of BFM musicians as well as some from the community) accompanied us for the singing of Christmas carols, and also played Bach’s Christmas Oratorio and the overture to Mendelssohn’s Elijah. The Tuesday before Christmas, we had our yearly Candlelight Meeting for Worship, a welcome respite from the busy-ness of the season, and an opportunity for deep spiritual nourishment. 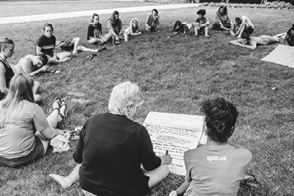 Other committees and ad hoc groups continue to provide many other opportunities for deepening our knowledge of one another, growing our faith and practice, and engaging with others beyond our Quaker Meeting in the interests of social justice and right relationship to the earth. We are grateful for all the work that goes on behind the scenes to provide such a rich array of opportunities for us. We have been fortunate to have many activities over the past few months that have fostered community life, helped to educate us about important issues, expressed our desire to be of service, and deepened our spiritual lives. Our Adult Religious Education Committee has sponsored a variety of sessions over the past few months – in several of them, we have heard about the spiritual journeys of some of our members; in others, we have covered topics from “The Power of Early Quakerism” to “Opening to Vocal Ministry” to “Building a Movement to End Jim Crow.” In April, we had our yearly perennial sale and Spring Fling, both of which raise money for the Ramallah Friends School; this year we were able to raise enough money for three scholarships for student to attend RFS. Our Advancement and Outreach Committee again offered a “Getting to Know You” session, in which we encourage both newcomers and long-time attenders/members to get to know one another and to reflect on questions about Quaker faith and practice. The series, “Experiment in Light,” continues to thrive, with meetings twice a month. In these meetings, members and attenders gather to use the guided meditation created by Rex Ambler in Light to Live By, an effort to reflect the experience of early Quakers as they sought guidance. We have a new monthly event, our Bethesda Friends Meeting book group, in which we read books on Quaker faith and practice, such as Kelly’s Testament of Devotion, as well as other current books addressing spiritual/historical/cultural issues, such as Reza Aslan’s Zealot, and David Brooks’ The Road to Character. Summaries of our discussions are posted, so that those unable to make a particular meeting are able to read something about the thoughts of those who were able to attend. Our Religious Education Committee has sponsored some wonderful sessions for the children, as well as the adults, called “Let your Life Speak,” in which we hear from individuals in our Meeting about the way their careers reflected their Quaker values. Our Friendly 8’s groups – one for adults only and one for families, continue to meet for potluck dinners and discussions. In May, we had a service day at Wider Circle, a non-profit organization in Silver Spring which assists individuals and families transitioning from shelters to more stable living situations. We are blessed to have a community so rich in collaboration, cooperation, and exploration. We have been fortunate to have many activities over the past few months that have fostered community life, helped to educate us about important issues, expressed our desire to be of service, and deepened our spiritual lives. Our Adult Religious Education Committee has sponsored many sessions over the years in which we heard members talk of their spiritual journeys. In April we heard from our member, Marion Ballard, about her spiritual journey. Adult Religious Education also sponsored a session on the pamphlet, “Envisioning a Moral Economy,” and later in the spring arranged for members and attenders to have a tour of the Slave Museum in Sandy Spring. In April, we had our yearly perennial sale and Spring Fling, both of which raise money for the Ramallah Friends School; this year we were able to raise enough money for three scholarships for student to attend RFS. Our Advancement and Outreach Committee again offered a “Getting to Know You” session, in which we encourage both newcomers and long-time attenders/members to get to know one another and to reflect on questions about Quaker faith and practice. The series, “Experiment in Light,” continues to thrive, with meetings twice a month. In these meetings, members and attenders gather to use the guided meditation created by Rex Ambler in Light to Live By, an effort to reflect the experience of early Quakers as they sought guidance. Our Friendly 8’s groups—one for adults only and one for families, continue to meet for potluck dinners and discussions. In May, we had a service day at Wider Circle, a non-profit organization in Silver Spring which assists individuals and families transitioning from shelters to more stable living situations. 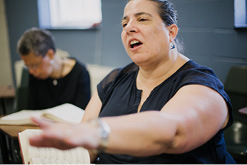 And this summer, we have had three sessions discussing the book The New Jim Crow. We are blessed to have a community so rich in collaboration, cooperation, and exploration. Spurred by the 2012 Annual Session report from the ad hoc Committee on Gender and Sexual Diversity Concerns, Bethesda began looking in its Archives this fall to find copies of licenses & certificates of marriages taken under our care. We found that there are holes that need plugging in our corporate memory. In turn, this prompted us to make sure we can easily access a document that lists past clerks of our Meeting. These forays into our history have been interesting! Jim Moody, a Bethesda attender who served in Congress for 10 years as a representative from Minnesota, addressed several inaccuracies contained in a chain letter that is currently circulating asserting that members of Congress receive excessive pay and benefits. Jim told the Peace and Social Justice Committee that he didn’t believe the pay ($80,000 when he served in the 1980s, $174,000 now) is excessive given that members must maintain two residences—one in their home district and a second in the DC area. Jim also felt members of Congress should receive a decent salary so that those who are not wealthy still are able to run for and hold office. We are preparing for a second year of Spiritual Formation this coming fall. Many of the participants from last year will be continuing their Spiritual Friendship groups while new Spiritual groups are being formed. We are continuing a What Do You Mean By…? series. Last year we looked at Quaker jargon and this year will focus on Quaker Testimonies: SPICE [Simplicity, Peace, Integrity, Community, and Equality]. Join us each month on the second First Day at 9:30!